Mi ake furniture that people can be comfortable [living with," said Sam \laloof, the noted chairmaker. This same guiding principle is at the heart of the furniture I budd. Optimum comfort certainly applies to chairs, and the same holds true for dining tables.When budding a dining table, i start by finding out how the owner likes to dine and where the table is going. i use this information to come up with rough sketches and scale models, which convey material and proportions better than drawings. Then i measure everything—people, dining room, rugs, existing furniture, and china — so I can translate dimensions to drawings and occasional mock-ups. How a dining table relates to its users is just as important as how it relates to its surroundings.The best tables are the ones that make tiny compromises. For example, when budding a table for a family with children, the durability of the finish on the tabletop outweighs the need ofthe finish to be authentic to the table's style period. Fortu nately, there are some simple guidelines that wdl help with design decisions. SHAPING REFINES A TABLE'S design. The author first uses models, measurements and full-scale drawings to work out a dinlng-table design. Plywood templates (foreground) help execute that design. But even so, subtle shaping In the shop makes the table more Inviting to the touch and to the eye. IT TAKES MORE THAN a measuring tape for good table design. The author uses small models, full-size chair and sideboard mock-ups, full-scale drawings and templates. to be increased or decreased depending on the the type oflable, the space needed for the chairs, or how else the table might be used. Figure 1 shows a typical table plan for sealing six people. Basic dining dimensions I've found thai the most comfortable height ofa dining table is between 28 in. and 28M in., which is a bit lower than what the textbooks say. But for a family, that height is more informal and makes the sitters feel relaxed. The height, of course, depends on the chairs and whether the table has an apron that will limit leg clearance (see Figure 2 on p. 98). The width and shape ofa dining table's top also affect seating arrangement. Most chairs are 20 in. wide or so, but you will need better than 24 in. of pi ace-setting width for most people and even more if you're dealing with squirming teenagers. 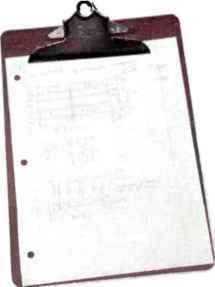 For the minimum overall width ofthe table, 1 use 36 in. A table much over 40 in. wide will lose any feeling of intimacy between eaters on opposite sides. An oval top offers more side seating than a rectangular top of sinrilar square footage. (It's easier to squeeze two more people in at the ends ofan oval when company comes over). But because square and round tables take up less space, they often fit better in small dining areas. After you've figured out the seating and overall table size, take out a tape measure, sit at a comfortable dining table, and think about the relationships of sitter to chair to table. Then start taking real-life dimensions. With the biggest sitter in a relaxed, seated position, measure the distance between his or her elbows and knees. Measure knee heights, and add a little extra to establish die bottom ofthe apron height. Measure how far forward the person likes to put liis or her feet. Measure dinner plates, serving platters, and the room where the table is going. Exact dimensions aren't as important as how they all relate. Most styles offurniture offer variations for dining tables, such as top shapes, woods to use, and options for bases. 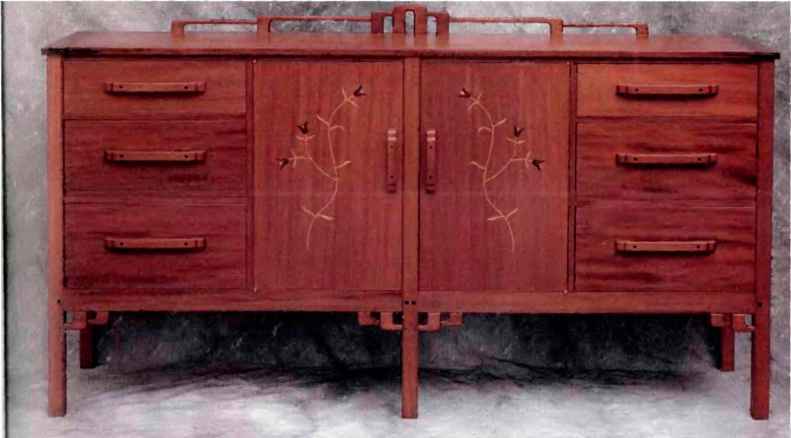 It's worth looking at lots of examples ofthe period you're working in because you may have to do some hybrid designing to come up with a table that matches a sideboard or china hutch. Similarly, if you're making a contemporary table, it's useful to know the tastes ofyour client because you're likely to borrow the lines or elements of his or her favorite furniture pieces. Here's where models can help. When I build quarter-scale table models, I make several variations to help the customer visualize differences in proportions and materials. I use various woods to show what color, figure, and grain patterns will look like in the room. Alternative shapes for the top, such as free-form edges and book-matched halves, are another example of what models can depict. Models can also present a variety ofbase forms, which show how much room there will be under the top and how stable the footprint will be. The following are the four most common base types 1 use. Single pedestal In terms of stability and looks, the mahogany model (the first one in the photo below) shows the relative proportions a single-pedestal table should have. An oval top resting on a single-pedestal base wdl allow for extra sitters. Because this type oftable has a central column, it makes sense to have an even number ofpcople on each side (an odd number can cramp the person sitting in the middle). Single pedestals also lend themselves well to a round top, but there is a size limit that the pedestal will support. I limit round tops to 54 in. dia., unless the undercarriage is quite heavy. A rectangular lop on a pedestal shouldn't be much over 72 in. long. Double pedestal A double-pedestal table (the second model in the photo below) will fit an odd number of sitters per side staggered around the columns. The model shows how a free-form top, here in wormy red maple, looks over a walnut base. The top's slightly asymmetrical shape, which widens in places, actually offers extta knee space where the curved vertical members are.The two pedestals spread out the center of gravity, so the table can be quite long. Double-pedestal tables are good for expansion (using draw leaves) because the place settings will be in the right spots. Formal dining tables can be up to 42 in. wide. For single pedestals, limit circular tops to Trestle 54 in. dia.. rectangular or g tops to 72 in. out leaves, a nestle table can be long because the length mainly depends on the sttength of the stretcher and how far the top boards can span. 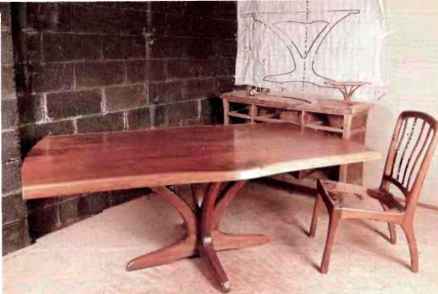 In Ihe case of the trestle model, the book-matched cherry top has butterfly keys joining two large boards, similar to classic George Nakashima tables. The model also shows that the base uprights are shaped inward at knee level to accommodate sitters at the ends of each side. There are two major drawbacks of a nestle table: first, it requires lots of overhang (compared with a leg-and-rail table) al each end to give enough room for end sitters. To allow for this, pull a chair up to the edge of a dining table, and measure how far in the ends are. I generally allow 16 in. as a minimum amount of overhang all around the tabletop. Second, the trestle's feet interfere with people sealed al the ends of each side. QUARTER-SCALE MODELS SHOW table options-From the left, the model bases are single pedestal, double pedestal, trestle, and leg and rail. Models also present wood choices. DESIGNING FOR FAMILY NEEDS The author had the family in mind when he designed this table to seat six comfortably, with room for a high chair. He used end leaves to allow plenty of elbow and leg room without dividing or disrupting the figure in the tabletop's center. Leg and rail Leg-and-rail tables, such as the fourth model in the photo on p. 97, can be strong, as well as quick and economical to build. 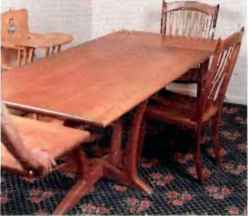 But because a table's legs can take up much of the sitter's leg room, 1 give each sitter at least 28 in, of width for com fort because about 3. in. is lost around each post. Or a leg-and-apron table can be fitted with a bow-sided top, like the model, and the legs spread out to the corners to provide more seating room. 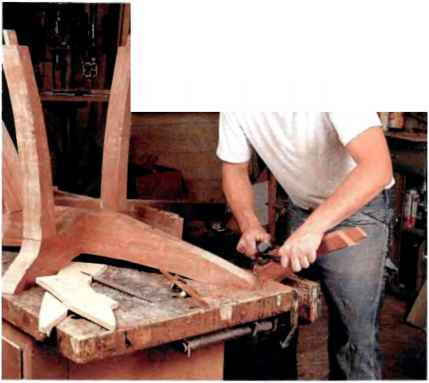 1 build leg-and-rail tables slightly higher—about 29 in.—to allow enough leg clearance because the apron will take up some height.To do this, determine the bottom of the apron height by measuring the largest sitter in a chair. Chairs are typically 1TA to 18 in. high at the seat. Allowing 6 to 7 in. for the thighs to go under the top, the bottom of the apron should usually be 2414 to 25 in. above the floor (see Figure 2). Proportions are such an important part of overall design. I've found that one-quarter scale drawings and models bring up the design issues and questions that 1 need to present to the customer. But to work out final construction details and to produce templates, 1 usually make full-scale drawings. I then use the templates to shape the parts (see the photo on p. 95). There are benefits to using solid wood for the whole table, including the top. F'or me, the durability, variation in grain, and smooth transition oftop to edge make solid-wood lops worth the effort. Though veneered tops may be stable and show consistent pattern and color, there are ways of achieving sunilar results in solid wood. For stability, I use only well-seasoned stock. To keep the boards flat, 1 rough-mill in several sessions over two weeks to acclimate the wood to my shop. The best way I've found to keep consistent grain and figure patterns is by using the widest boards available. Wide boards are usually much easier to match than narrow ones. 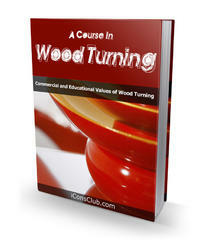 For color continuity, 1 like the logs that are to be cut into tabletop stock to be sawn clear through. If this isn't practical, select boards from the same lot, and buy all your wood at the same time.Then when gluing up the top, go for the best grain match radier than trying to orient all the end grain a certain way. Changes in top thickness as small as Vv, in. can have a dramatic effect on how we perceive the table as a whole. My tops vary from I to VA in. thick. 1 allow extra thickness for planing the wood a few times before matching up the boards for glue-up. Longer boards will likely be cupped or twisted, so give yourself enough wood rather than under-sizing die top's thickness just to get it flat.When connecting the top to its base, allow for seasonal movement by using screws in slotted holes or cabinetmaker's buttons. PETER TISCHLER is a North Bennet Street School graduate who runs a chairmaking and cabinetmaking shop in Caldwell. N.J. Comfortable table height is 28 to 28% in.. 29 to 30 in. for apron tables. Bottom of apron is 24'A to 25 in. from floor. Allow clearance for knees: shape trestle or pedestal for leg placement. Chair seat height is 17% to 18 in. IACKLING BIG JOBS like my nine-drawer dresser used to be a nighl-• "'• •- marc. It has well over 100 parts and even more joints, but through the years, I've developed a few strategies that make the process a smooth and enjoyable one. I limit die number of details I have to keep in mind and break the process into easily manageable steps.Widi my tactics, I'm able to get the most out of my time, techniques, and materials. 1 also get a litde more sleep. I use quick but accurate drawings and cut lists to make sure that my projects are well organized even before 1 mill the first board. I dimension all the parts at once and cut my simplified joinery with oidy a few machine setups. Parts are always neatly stacked, clearly marked, and easily found. I first build small sections that are easy to handle and then bring them together in a final sturdy case. Assembly and glue-up becomes a rewarding and almost leisurely task.